The Children of Raxxla (CoR) are a group of Commanders setting out to solve the mysteries and myths of the Galaxy and to thwart the efforts of those who would withhold information and manipulate the facts for their own gain and agenda. The Children often operate alone or in small ‘cells’ where they follow their own individual goals but they are ultimately sworn to this common goal. In times of uncertainty and strife, we become a covenant unhampered by allegiance and distance. With this being the case, becoming a Child of Raxxla is very different from enlisting in the armed forces or joining the forces of the various Powers. It is a process that begins with making oneself known, continues with proving oneself and one’s skill and abilities and ends with… well, no one knows. Maybe it never ends. CoR is looking for players on all platforms who are enthusiastic and interested in the lore and back-story of the Elite universe. They should be willing to team up and engage in various modes of play with the goal of solving the mysteries and riddles laid out before us and to protect humanity from itself and the machinations of shadowy organisations. The following is a guide for our recruitment principles. It is in no way hammered in stone but should give good counsel when judging applicants and their efforts to join. Nor is it intended to substitute common sense and the occasional gut feeling with a strict adherence to the guidelines. You will need to have an activated account for the CoR forums in order to apply. If you would like to get in contact with us prior to applying for membership, feel free to contact us with the contact form you can find on our web page. When you make an application to CoR you are expected to provide us with information about yourself, including Cmdr name, personal age, gaming platform, play style and further contact details, if you want to. You will also need to state that for the duration of your membership in CoR you will adhere to the Frontier TOS and EULA and only conduct aggressive actions against other players (PvP) in Consul sanctioned operations. You are invited to augment your application with a text about your motives, goals in the game and prior endeavors. This can be in prose or roleplay. It should provide additional information and background on the ‘real’ person and the Cmdr who wants to join CoR. Likewise, you are welcome to give additional links to fan content you have created to flesh out your story even further. However, it’s not mandatory to write a full letter of intent or to prove your expertise in various aspects of the game. You are welcome to come from any background and play style, although some styles are more suited for accomplishing CoR’s goals than others. Ideally you will have a background in a scientific or exploration related group with a number of contacts still active. Combat experience is good to have as CoR pilots can find themselves in dire straits from time to time. It is not mandatory for you to have read any Elite novels but it certainly helps. There is a wealth of information to be gained from the novel that correlates with past or contemporary events in the game. We encourage everyone joining our ranks to read them. What’s also helpful is having read any science fiction or criminal novels or having a fan background in sci-fi in general. You should demonstrate you understand the basic principles of the game universe and the situation it is currently in without having to prove you have already solved any puzzles or having been to special locations. Again, none are mandatory. There are a number of areas of interest that become important every once in a while, including (ancient) history, astrology, astronomy, graphic and/or video design, encryption methods and mass communication. If you are versed in one or more, that’s fine and considered a bonus. Once you've been accepted as a Child of Raxxla you are welcome to post a more in-depth Commander profile on the linked thread below. This one is purely voluntary and may be used as a source of information for CoR roleplayed events. Who are the Children of Raxxla? CoR are a player faction that has a large emphasis on role play - particularly role playing stories and in-game events that are linked to the mysteries of the galaxy. They have no allegiance to any of the power blocs and treat all with equal suspicion. As a result of this, and a consequence of their actions and accusations against certain leading power play figureheads and exposing the Shadow Cartel during the Dynasty Conspiracy, CoR are viewed as a dissident faction by those subservient to the major factions. CoR were born out of the original investigations into the Formidine Rift, circa Feb/Mar 2015, although the group didn't exist in any official capacity until FD introduced player factions later that year. 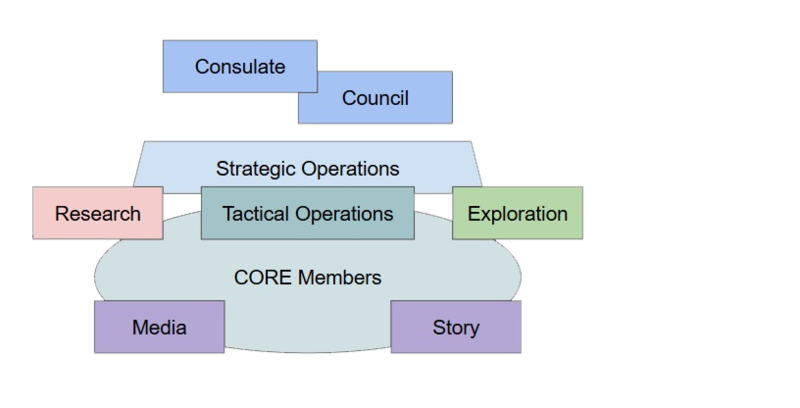 CoR have a dedicated Investigative team that work on the clues and hints released by FD and/or found in-game, dedicated operations teams designing both short and long term campaigns and initiatives, and dedicated media and roleplay teams that work on events, articles, videos, and projects that are based on whatever actions CoR pilots take in-game. And although players have been assured that their in game actions can influence the narrative, none of CoRs role played events or articles (nor anyone else's) should be seen as official parts of the story until acknowledged as such by FD. The Children of Raxxla rarely post on the Frontier forums about CoR affairs, and although its members are discouraged from revealing that they are a member of CoR, this guideline is not enforced. First among them is the belief that several and perhaps many mysteries exist in the galaxy – mysteries that are far beyond the scope of what we’re currently led to believe by taking mainstream news at face value or by accepting the statements and actions of the major power leaders as un-obfuscated truths. Discovering and revealing the nature of these mysteries is a core component of the CoR ethos. This spirit of discovery often takes us far from the safety of inhabited space but we do not fear this. Second, the CoR do not trust fully the words or actions of any major power or major power leader based on these powers’ history of disingenuous and in some cases blatant deception or warmongering. We understand that too often, the motives and incentives that drive the actions of major powers and their leaders are not well aligned with those of the majority of citizens of the galaxy nor in their best interest. We harbor no explicit ill will towards these powers and CoR understands that some of its members may, at times, work with and among these galactic powers. So long as these CMDRs maintain good standing with the CoR, with other CoR CMDRs and do not actively seek to undermine the efforts of the CoR we make no judgement against them. Third, regarding our approach to secrecy the CoR seek to make discoveries regarding the nature of galactic, scientific, political and anthropological mysteries and phenomena for the benefit of all galactic citizens. In an ideal galaxy filled with reasonable and just people, information known to the CoR would be shared immediately and freely in all instances. However, reality requires that we employ care, strategy and sometimes cunning in how we communicate sensitive information outward from ourselves less we find that parties and powers with self-interested motives use potentially powerful information acquired first by the Children of Raxxla against those not powerful enough to defend themselves. To this end the CoR must walk the fine line between the shadow and the light – seeking to avoid harming others through the careless sharing of dangerous information while taking equal care to avoid harm falling upon us from those who say we lack sufficient transparency. Fourth, we believe that true Children of Raxxla membership is based on merit: on contribution to our internal information pool, participation in group operations, and any contribution to the overall organizational culture. From a roleplay perspective, CoR membership requires the renunciation of all prior and future political allegiance. From a gameplay perspective members are free to be affiliated with Power Play factions in order to gain access to sought after PP specific 'perks'. Our members are free to ply their trade throughout the gameworld as they see fit, so long as when they’re on CoR 'duty' they don't allow their allegiances or activities to conflict with the CoR ethos or directives. As a role-player, playing the role of a semi-secretive commander, we trust you to respect that guideline. The exception being groups who are in direct conflict with CoR. In such cases we will expect you to sever all ties with any group who is hostile to CoR if you want to remain a member of CoR. The Children of Raxxla are encouraged to roleplay their secretive persona - although this is not mandatory. Remember, you are part of a shadowy group of Elite pilots, sworn to secrecy regarding your true identity and what you’re up to in game. Openly stating that you are a member of the Children of Raxxla is discouraged, but Consul understand that this is not always possible and some players will always want to post with their CoR banners and signatures on show. This is fine as long as non-Consul members don’t pose as official spokespersons for CoR when communicating with the general public. Last but of at least equal importance to the above, the CoR looked to the experience, leadership and insights of the late Salomé, formerly Senator Kahina Tijani Loren of the Prism system, for guidance and direction as we follow our guiding principles and seek to uncover the secrets of the galaxy.